Quick Savings » Travel » Revolut Review – Is it the best way to take money abroad in 2019? Revolut, which describes itself as a ‘digital banking alternative’, features among a raft of companies that are transforming the way that consumers engage with their finances. Revolut was launched in July 2015 by Nikolay Storonsky, a former trader who worked at Lehman Brothers and Credit Suisse, and Vlad Yatsenko, who previously built financial systems at investment banks. Revolut started life as a pre-paid card and app, which allowed travellers to switch cheaply between currencies. It was born out of Storonsky’s frustrations with existing foreign exchange products. Since then, the company has expanded its range of products and services. The fintech company currently has more than three million customers across the UK and Europe, and continues to develop its proposition. How does the Revolut card work? Unlike high street banks, Revolut allows you to set up a current account with no paperwork. They say that it is possible to open a sterling or euro current account in 60 seconds – and this was my experience using the app. Initially, they do not carry out any initial credit checks or require proof of address. The first step is to decide whether you wish to open a free current account, a premium account at £6.99 per month or a metal account at £12.99 per month (more information on this to follow). One of the first things the app asks you to do is to top-up your account. By adding money from a verified existing bank account that is under your name, Revolut effectively uses this as an initial security check. A day after setting up the account, Revolut asked me to scan proof of ID via the app. It isn’t possible to top-up your account until this process is completed. Fortunately, it didn’t take long. You can either take a picture of your passport or driving licence. They then ask you to take a selfie using their camera function to double check the likeness of the picture ID you have submitted. Revolut sent me a text message within two minutes to say my identity had been successfully verified (although they flagged that in some cases it can take up to 10 minutes to confirm). Revolut customers can order a physical or virtual card. The former is a pre-paid contactless debit Visa card, which can be used in retailers across the UK and abroad. A physical card can be ordered via the app for £4.99. Customers with Premium accounts receive a physical card for free. The next step is to set up a pin for the physical card to withdraw money from ATMs in order to use it at chip-and-pin payment terminals. The physical card can also be used for contactless and magstripe payments. Customers can turn on the ‘location’ security feature, which means Revolut will use your phone’s GPS location to prevent fraudulent transactions from taking place. In addition, magstripe, contactless payments, ATM withdrawals and e-commerce transactions can be disabled to prevent the card from being used fraudulently or cloned. You can also freeze and unfreeze your card at the touch of a button within the app. Revolut’s physical card can be used to transact in your base currency, as well as other currencies. When you load money onto the card you can choose to exchange it into a currency of your choice (i.e. dollars) so locking into the current exchange rate. Or you can just leave it as a cash balance in sterling and whenever you use your card abroad Revolut will automatically apply the exchange rate at that moment in time and deduct the appropriate amount in sterling. This makes it incredibly easy to use although you are playing the currency markets a bit. How does the Revolut virtual card work? Both of Revolut’s physical and virtual cards are tied to your Revolut account. The virtual card is free to order and can be set up in a number of seconds. I can vouch for this, having set up my virtual card on the app by accident! The main difference between the two is that the virtual card does not have a pin, so it can’t be used to withdraw money at an ATM and isn’t valid at some payment terminals. In addition, some of the security features are not available for the virtual card. On the other hand, Revolut claims that using the virtual card for online payments can help to protect against online card fraud. This is because the card can be deleted every few months and replaced with a new one. Revolut has added another layer of security for its Premium account holders via its disposable virtual card function. This automatically changes the card number every time a payment is made to protect the customer from fraud. How does the Revolut app work? Your Revolut account is managed via the app, which can be downloaded for free onto your smartphone or iPad. To become a Revolut customer, you must feel comfortable using your smartphone or device to manage your account. Fortunately, the app is straightforward to use and well designed. Revolut also has an Apple watch app which shows you notifications from Revolut on your watch face. It doesn't matter if you don't have an Apple watch as the notifications are simply shown on your phone instead. To set up the phone app, you will need a four-digit password or fingerprint recognition. a) Accounts – This is the first screen you see when you open the app. It summarises your accounts and their respective balances. b) Analytics – This breaks down your spending into different categories and allows you to set budget controls to help you to stick to spending targets. c) Payments – You can send money to bank accounts and other Revolut accounts via bank transfer or payment links, set up recurring payments, split bills, and pay contacts (by allowing the app access to your phone’s contacts). One of Revolut’s selling points is that it allows friends and family members to split bills easily using the app. d) Cards – This section allows you to set up a physical and/or virtual card and includes any controls you wish to put in place. For example, set a monthly spending amount, freeze card, view/unlock your pin and edit additional security settings. Premium – What the service includes and how to set it up. Vaults – Revolut’s customers can set up ‘Vaults’, where spare change from transactions or recurring payments can be placed. Each Vault has a specific purpose. For example, you may be saving towards a new car or your next holiday. Insurance – Device insurance can be purchased via the app. This includes worldwide coverage of screen and liquid damage. Alternatively, you can set up travel medical insurance, including dental cover and ski coverage. You can either sign up for a year or you can make the insurance active only for the days you are away. Credit – Revolut uses peer-to-peer platform Lending Works to provide its customers with credit at a competitive rate in comparison to high street banks. This credit can be overpaid or settled early at no extra cost. Rates – This shows the interbank exchange rates which Revolut offers. Users can also set up alerts if chosen currencies cross a certain threshold. Help – This is Revolut’s customer service function. Here, customers can seek advice on different topics, read the company’s blog, ask Revolut’s two million plus users questions via its ‘community’ tab, or speak directly to Revolut online. Profile – You can check your account details, set top-up limits, change your passcode and amend your privacy settings. How does Revolut work abroad? Revolut’s customers can use the physical, pre-paid currency card to make payments abroad fee-free using the interbank exchange rate in over 150 currencies. This is the rate that banks offer to each other when exchanging currencies and is much more competitive than the rate offered at a bureau de change or by most other pre-paid cards. This makes Revolut one of the most attractive app only current account cards available on the market. It is worth noting that on the weekend Revolut typically applies a mark-up between 0.5% and 1% to the interbank rate (depending on the currency). This is because foreign exchange markets are closed. Customers with a current account can take out £200 per month fee-free at an ATM, after which point a 2% fee is applied. Up to £5,000 can be spent, transferred or exchanged each month with a standard current account. After this point, a 0.5% fee is applied. Premium/Metal account holders are entitled to £400/£600 of fee-free ATM withdrawals per month and unlimited foreign exchange transactions at the interbank exchange rate. Revolut’s customers can also transfer money to bank accounts for free in over 120 countries using the interbank exchange rate. Revolut offers fee-free transfers in 25 currencies to banks, businesses or friends using the interbank exchange rate. What products does Revolut offer? Spend, transfer or exchange up to £5,000 each month at the interbank exchange rate. After this point, a 0.5% fee is applied. Free ATM withdrawals up to £200 per month, with a 2% fee applied thereafter. Bank transfers in multiple currencies. Revolut does this by providing you with a unique sterling-denominated account number, as well as a euro-denominated IBAN. Using the Revolut card to make fee-free transactions on holiday will almost certainly result in significant savings, particularly in comparison to using a debit card from a high street bank. You are effectively able to cut out the commissions on foreign exchange transactions and get access to the best exchange rate. Revolut estimates that its customers typically save £46 per trip. Free overseas medical insurance, including medical assistance abroad up to £15 million, emergency dental treatment up to £300, with an excess of £75. The policy is provided by White Horse Insurance Ireland. Trips must not exceed 40 days and the account holder is covered for 183 days during a 12-month period. The Revolut app is also easy to use and has greater functionality in comparison to the apps and websites offered by some of the high street banks. One important point to consider is that you have to manage your account solely via the app. This means Revolut is appropriate for those who are comfortable using technology, as your main interactions with the company will be online rather than on the phone or face-to-face. Is Revolut Premium worth it? I find it quite difficult to come up with reasons why it is worth paying for a premium or metal Revolut card as you get a lot of the same features that you would on the standard card. The only major benefits are the cash withdrawal limits are higher but unless you are often abroad or travelling to a country where you need to carry cash, I can't see the need to use them. A Premium account could make sense if you lead an international lifestyle and need to make a significant amount of foreign exchange transactions. It is also worth considering how the travel and device insurance compare to those available on the market. Do they offer good value and suit your requirements? 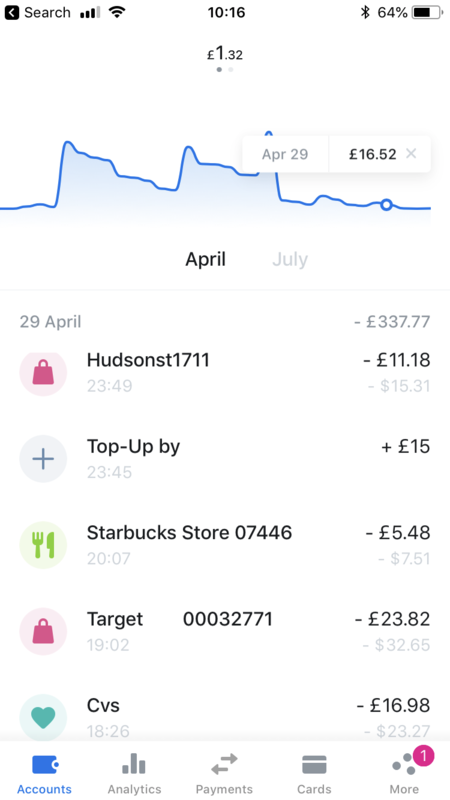 Revolut’s closest competitor is Monzo, where accounts are also managed via an app and its customers can use a spending tracker. Monzo offers mostly fee-free spending abroad, but it applies a 3% charge if its customers withdraw more than £200 from an ATM each month. However, Monzo currently has one major advantage over Revolut: it is a fully licensed bank. This means that each Monzo account holder has up to £85,000 covered by the Financial Services Compensation Scheme (FSCS) should something go wrong with the business. It has also joined the Current Account Switch Service (Cass), making it easier to switch a current account to Monzo, including direct debits and standing orders. Until the banking license is fully approved, Revolut remains regulated by the Financial Conduct Authority, so current accounts are ring-fenced in a Barclays account. This means the money would be safe should any problems arise at Revolut. Starling Bank offers similar services to Monzo and Revolut. It is also digital-first and allows its customers to set up savings pots for specific goals and to send money in 19 different currencies. Starling’s marketplace features a range of tie-ups with third-parties. These include Moneybox, which rounds up your spending to the nearest £1 and automatically adds the change to an ISA, online investment company WealthSimple and Yoyo Wallet, which allow you to collect points and rewards at certain retailers. Starling also has a banking license and is FSCS protected. How much does Revolut cost? During the week, an additional 1% charge is levied on the interbank rate for the Thai baht, Russian ruble and Ukranian hryvnia. On the weekend (when the market is closed) a 2% mark-up is applied. For other major currencies, the interbank rate is applied and a mark-up of 0.5% to 1% is applied during the weekend. The Premium and metal accounts costs £6.99 or £12.99 per month. On top of this charge, customers pay 2% of the value of ATM withdrawals above the £400 or £600 monthly limit. Weekend foreign exchange charges also apply. Meanwhile, for business account holders the charging structure is slightly more complicated. For further information, you can check out the full list of fees on Revolut's website. So how does Revolut make money? Given that Revolut’s app and website is littered with the phrase ‘fee-free’, you may be wondering how the company makes money. Premium account and business account fees appear to account for a significant portion of Revolut’s income. The company also collects a nominal fee from a merchant every time a customer spends money using their Revolut card. In addition, the charges outlined in the section above generate revenue for the business, as well as the credit service and affiliate agreements with third parties, such as insurers. What are the alternatives to Revolut? You can top-up this card with up to 10 currencies and lock in exchange rates in advance. If you don’t have enough money converted into a particular currency, you can draw funds from a different currency on the card. However, to do this Travelex will levy a 5.75% fee on each transaction. On the plus side, there are no overseas ATM charges or ATM withdrawal limits. However, there is an ‘inactivity fee’ of £2 per month if the card has not been used for 12 months. This card can hold up to 15 currencies and does not charge transaction fees. There are no fees for overseas purchases or international ATM withdrawals. In addition, there are no monthly ATM withdrawal limits. However, the card must have a minimum of £100 loaded up. Caxton levies a £4.50 charge plus 2% of the amount withdrawn for over the counter cash taken out abroad and at home. If you wish to complete a foreign exchange transaction in a currency that isn’t loaded on the card, Caxton applies a 2.49% mark-up. In addition, if you want to use the card in the UK, there is a £1.50 charge for purchases and ATM withdrawals. Caxton also applies a £0.85 charge per month if you stop using the card for more than 12 months. Revolut's exchange rates are clearly the best. As you can see from the rates quoted above, Revolut offers its customers real savings by using the interbank exchange rate and cutting out commissions. It represents a market leader in this respect and I think it is a great solution for anyone looking to use a card for their next holiday. Revolut’s analytics function and budget spending limits could also prove useful for day-to-day spending, while the savings vaults can help you to squirrel money away unwittingly. The monthly ATM withdrawal limits represent a niggle, particularly if you are travelling to a country where you need to carry cash. With this in mind, you need to consider whether the charges you will incur outweigh the savings you can make on the underlying exchange rate. Perhaps the biggest drawback to Revolut is that it is not a licensed bank, which means its customers are not protected under the FSCS, but this should change in the coming months now its European banking license has been approved. Once this is finalised, it could be worth considering using Revolut for everyday banking. 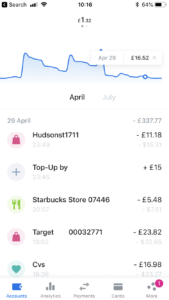 One way to limit exposure in the meantime is to only top-up your Revolut card as and when you need to rather than leave large balances on the card. This isn't a problem as top-ups happen instantly when you process them via the app. So you can even top-up the card while you are in a shop queue waiting to pay. If you are considering using any of the so-called challenger banks, it is important to think about their longevity. In this respect, Revolut appears to have a bright future. The company raised $250 million in April of last year, valuing the business at $1.7 billion. It also claims to have broken even in December 2017. Another selling point is that the customer appears to stand at the heart of the proposition – let’s hope this continues. Monese review: is it the best bank for your money? Monese was one of the first app-only banks to launch in the UK.